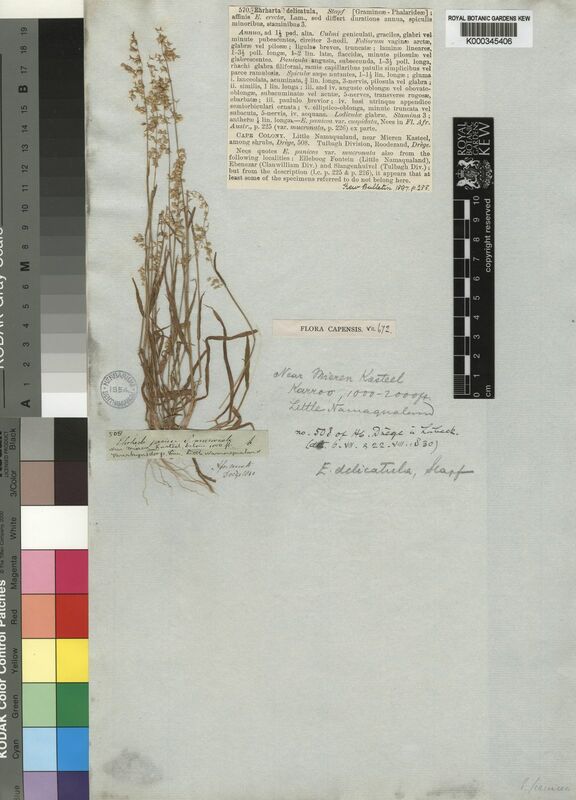 This genus is accepted, and its native range is Eritrea to S. Africa and S. Pacific. Spikelets with mostly subequal glumes, shorter than or as long as the spikelet; sterile lemmas glabrous or hairy, 1 or both often transversely ridged or wrinkled, awned or awnless, the upper sometimes with basal appendages or tufts of hair, its hook-shaped base forming a hinge between first and third lemmas; palea 2-nerved, the nerves close together. 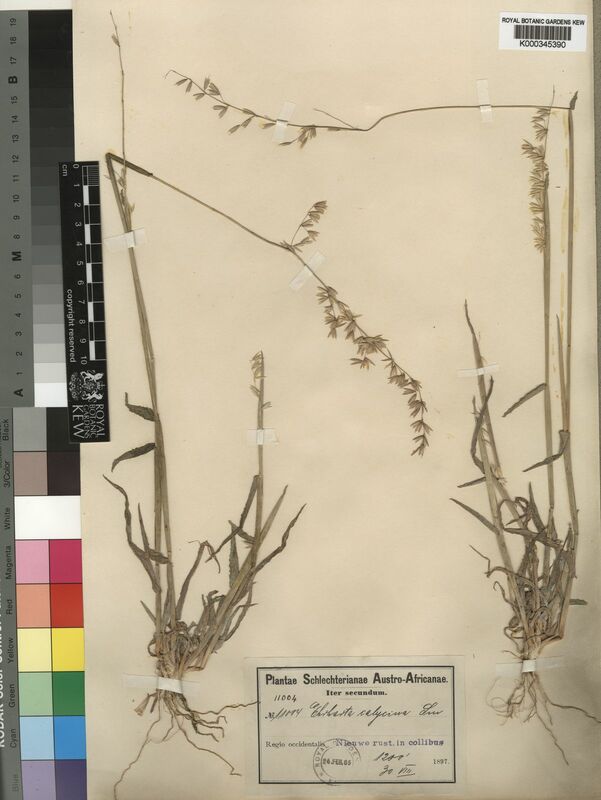 Spikelets strongly laterally compressed, solitary, pedicelled, 3-flowered; the first and second florets sterile, reduced to empty lemmas, the uppermost hermaphrodite. Glumes 2, equal or unequal, usually shorter than, rarely as long as, seldom longer than the rest of the spikelet, 1-11-nerved, persistent, membranous, obtusely keeled. Lemmas heteromorphous; the sterile ones (1 and 2) equal or unequal, almost always exceeding the glumes, compressed, usually cartilaginous, awned or muticous, 3-5-nerved, transversely rugose, tuberculate or smooth, the second one often with variously shaped callous appendages at the base; the fertile one (the uppermost) shorter than the sterile ones, often hinged with the second sterile one by basal callous knob-like appendages, usually 5-nerved, indurate but less so than the sterile ones, muticous, sometimes transversely rugose or tuberculate but more often smooth. Paleas slightly shorter or as long as the lemma, 2-nerved, with the nerves very close together, 2-keeled, membranous. Stamens 6 or 3, very rarely 1. Ovary glabrous, ovoid; styles distinct; stigmas plumose, laterally exserted above the base. Caryopsis elliptic in outline, strongly laterally compressed, embryo c. 1/5 the length of the caryopsis. Annuals or perennials of varying habit. Leaves with the laminas often greatly reduced. Ligule membranous or scarious but sometimes reduced to a rim of hairs. Inflorescence a panicle, rarely a raceme, usually rather dense, compact or interrupted, sometimes spike-like, more rarely loose and open, sometimes secund. Annual (5), or perennial (31). 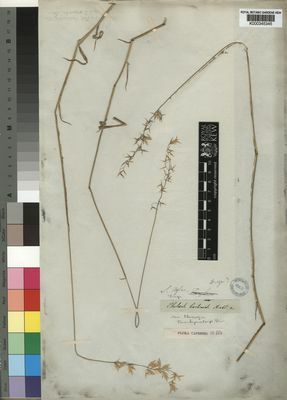 Rhizomes absent (18), or short (9), or elongated (13). 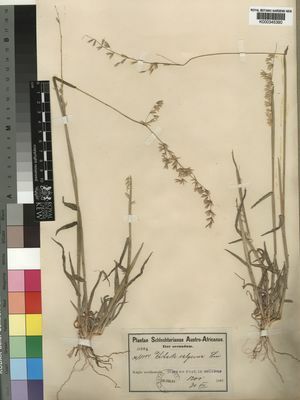 Stolons absent (34), or present (4). Culms erect (10/21), or geniculately ascending (4/21), or decumbent (10/21), or prostrate (2/21), or rambling (4/21); robust (1/4), or of moderate stature (1/4), or slender (2/4); 2-55.39-250 cm long; firm (28), or wiry (6), or woody (5); without nodal roots (1/4), or rooting from lower nodes (4/4). Lateral branches lacking (2/11), or sparse (1/11), or ample (4/11), or suffrutescent (5/11). Leaves differentiated into sheath and blade (35), or with blades commonly suppressed, transferring photosynthetic function to sheath and culm (1). Leaf-sheath auricles absent (30), or erect (2), or falcate (4). Ligule an eciliate membrane (22), or a ciliolate membrane (14). Leaf-blades persistent, or deciduous at the ligule (3); aciculate (1), or filiform (3), or linear (31), or lanceolate (2); herbaceous (35), or coriaceous (1); stiff (1), or firm (33), or flaccid (2). Leaf-blade margins unthickened (1/2), or cartilaginous (1/2). 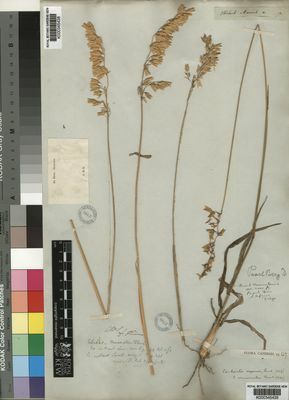 Inflorescence a panicle (29), or composed of racemes (11), or comprising only a few spikelets (4); subtended by an unspecialized leaf-sheath, or an inflated leaf-sheath (1); exserted, or embraced at base by subtending leaf (4). Panicle open (27/29), or contracted (11/29), or spiciform (1/29), or capitate (1/29). Primary panicle branches not whorled (28/29), or whorled at lower nodes (1/29). Racemes single (11/11); unilateral (4/4); bearing few fertile spikelets (5/11), or many spikelets (6/11); bearing 2 fertile spikelets on each (1/4), or 3-5 fertile spikelets on each (3/4), or 6 fertile spikelets on each (4/4), or 7-10 fertile spikelets on each (3/4). Rhachis angular (4/4). Spikelet packing contiguous (11/11), or lax (1/11); 2 -rowed (1/1). 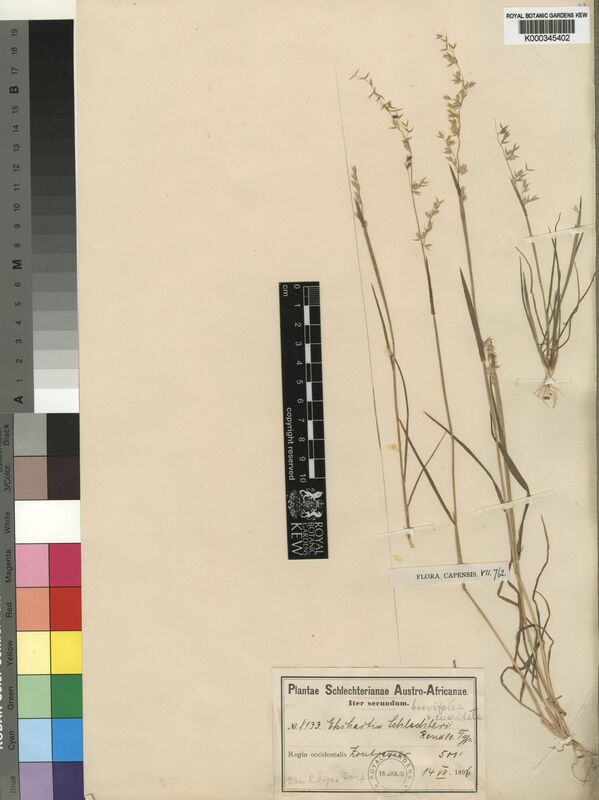 Spikelets appressed (3/6), or spreading (5/6), or deflexed (2/6); solitary, or in pairs (1). Fertile spikelets sessile (4), or pedicelled (32). Pedicels filiform (13/14), or oblong (1/14). Spikelets comprising 2 basal sterile florets; 1 fertile florets; without rhachilla extension (34), or with a barren rhachilla extension (3). Spikelets linear (1), or lanceolate (2), or elliptic (1), or oblong (29), or ovate (1), or cuneate (3); laterally compressed; 2-7.851-18 mm long; breaking up at maturity; disarticulating below each fertile floret. Rhachilla internodes brief up to lowest fertile floret (32), or elongated below basal sterile floret (1), or elongated between basal sterile florets (3). Floret callus brief (35), or evident (1), or elongated (1); glabrous (3/19), or pubescent (13/19), or pilose (3/19), or bearded (2/19). 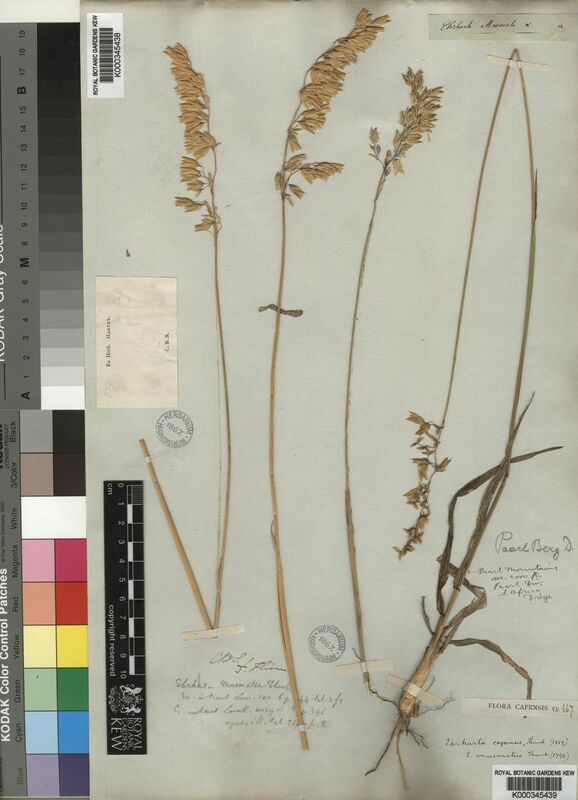 Glumes both absent or obscure (1), or two (35); persistent (35/35); shorter than spikelet (32/35), or reaching apex of florets (6/35), or exceeding apex of florets (5/35); thinner than fertile lemma (35/35); parallel to lemmas (34/35), or gaping (3/35). Lower glume lanceolate (2/35), or elliptic (7/35), or oblong (7/35), or ovate (18/35), or oblate (1/35); 0.25-0.7821-1 length of upper glume; hyaline (12/35), or membranous (15/35), or chartaceous (9/35), or herbaceous (1/35); without keels (25/35), or 1-keeled (10/35); 1 -veined (7/33), or 3 -veined (17/33), or 4 -veined (4/33), or 5 -veined (12/33), or 6-7 -veined (2/33), or 8-9 -veined (1/33). Lower glume lateral veins absent (5/35), or distinct (30/35). Lower glume surface glabrous (35/35), or pubescent (1/35). Lower glume apex entire (33/35), or erose (2/35); truncate (1/34), or obtuse (10/34), or acute (14/34), or acuminate (10/34); muticous (34/35), or mucronate (1/35). 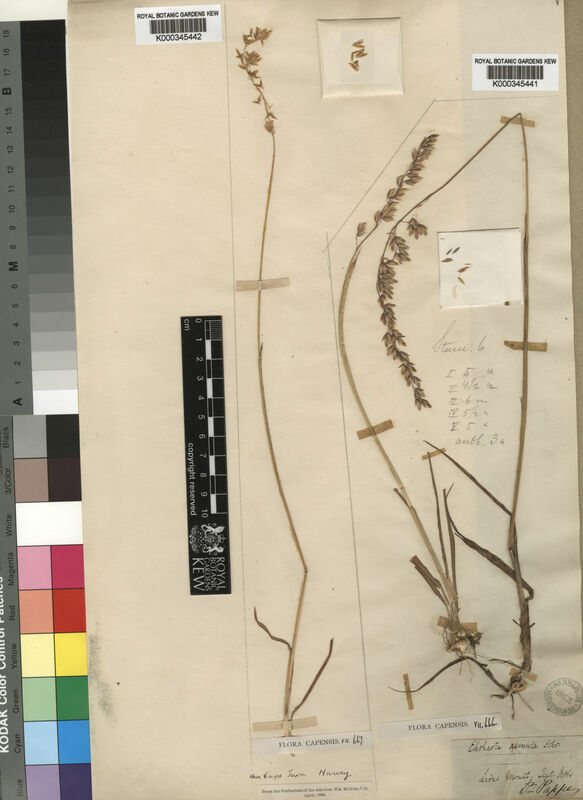 Upper glume lanceolate (3/35), or elliptic (6/35), or oblong (8/35), or ovate (18/35); 0.2-0.7174-1.5 length of adjacent fertile lemma; hyaline (12/35), or membranous (15/35), or chartaceous (9/35), or herbaceous (1/35); without keels (32/35), or 1-keeled (3/35); 1-5-9 -veined. Upper glume lateral veins without ribs (31/32), or ribbed (1/32). Upper glume surface glabrous (35/35), or pubescent (1/35). Upper glume apex emarginate (2/34), or truncate (2/34), or obtuse (7/34), or acute (14/34), or acuminate (10/34); muticous (34/35), or mucronate (1/35). Basal sterile florets barren; without significant palea. 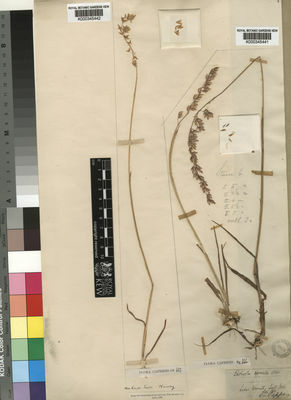 Lemma of lower sterile floret lanceolate (6), or elliptic (20), or oblong (8), or ovate (3); 0.33-0.9162-2 length of fertile lemma; hyaline (1), or membranous (1), or chartaceous (2), or herbaceous (1), or cartilaginous (16), or coriaceous (15); 3-4 -veined (4/31), or 5 -veined (28/31), or 6 -veined (8/31), or 7 -veined (11/31), or 8-9 -veined (2/31), or 10-11 -veined (1/31); without ribs (29), or ribbed (8); emarginate (1), or truncate (2), or obtuse (13), or acute (9), or acuminate (6), or attenuate (5); muticous (19), or mucronate (6), or awned (16). Fertile lemma lanceolate (2), or elliptic (25), or oblong (4), or ovate (5); hyaline (1), or membranous (2), or chartaceous (1), or cartilaginous (21), or coriaceous (12); of similar consistency on margins (35), or much thinner on margins (1); keeled; 3-4 -veined (2/28), or 5 -veined (20/28), or 6 -veined (6/28), or 7 -veined (13/28), or 8 -veined (1/28), or 9 -veined (2/28). Lemma midvein without distinctive roughness (33), or scaberulous (2), or scabrous (1). Lemma lateral veins obscure (4/4); without ribs (35), or ribbed (1). Lemma surface smooth (34), or asperulous (1), or tuberculate (2); glabrous (32), or puberulous (1), or pubescent (1), or pilose (2); without hair tufts (35), or with conspicuous apical hairs (1). Lemma margins eciliate, or ciliolate (1). Lemma apex entire (34), or erose (1), or dentate (1); 2 -fid (1/1); truncate (9/35), or obtuse (14/35), or acute (12/35), or acuminate (1/35); without ornament (33), or cucullate (1), or pubescent (2); muticous, or mucronate (1). Palea 0.66-0.8157-1 length of lemma; hyaline (1), or membranous (35); 1 -veined (6/28), or 2 -veined (21/28), or 3 -veined (1/28); 1-keeled (6), or 2-keeled (30). Palea keels separated (9/30), or approximate (21/30); smooth (35), or scaberulous (1); eciliate (35), or ciliate (1). Lodicules 2; membranous; glabrous (34), or ciliate (2); 2-toothed (3/3); obtuse (1/1). Anthers 2 (6/23), or 3 (1/23), or 4 (9/23), or 6 (8/23). Caryopsis with adherent pericarp (2/2); linear (1/3), or lanceolate (1/3), or ovoid (1/3). Embryo 0.15 length of caryopsis. Cleistogenes absent (35), or present (1). Africa (24), or Temperate Asia (1), or Tropical Asia (2), or Australasia (19), or Pacific (4), or North America (1), or South America (2). Ehrharta festucacea Willd. ex Schult. & Schult.f. Vet. Akad. Handl. Stockh. 40: 217, pl. 8 (1779). in Vet. Akad. Handl. Stockholm 40: 217 (1779), nom. conserv.